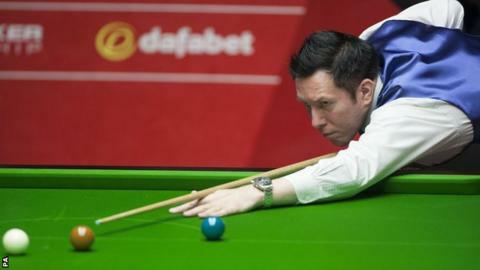 Dominic Dale hopes his "lucky" black and white striped shoes will help him overcome fellow qualifier Michael Wasley and reach the quarter-finals of the World Championship. Dale revelled in the Crucible atmosphere as he moved into the second round for the first time since 2000. The world number 24 secured an impressive 10-5 win over Mark Davis. "They are my lucky shoes so I will probably be wearing them in the next match," said 42-year-old Welshman Dale. "I am feeling confident about beating Michael - of course I am - but he will probably be pleased he is playing me. "I am looking forward to it. It is a great opportunity for one of us to get to the quarters. "He is a nice guy, he's a good mate and he has a heart of gold and if I don't beat him I will wish him all the best but I hope I do beat him." Dale led Davis 7-2 overnight and won a couple of scrappy frames to go 9-2 up. But the final frame proved elusive before Dale, who had lost in the first round at the Crucible on five occasions since making the quarter-finals in 2000, got over the line. His black and white striped shoes were as much of a talking point as his snooker, however. "I bought them in the Royal Arcade in Cardiff - black and white zebra stripes," he said. "Every home should have a pair. "They were expensive and don't go down well with everybody. They were about £165 - a special deal from £80! "I have had them for quite a while but they are not the sort of thing you wear in the nightclub. I don't want to draw attention to myself on the dance floor because I can't dance to save my life." Dale, nicknamed the Spaceman, sees his second-round meeting with Wasley as a fantastic chance to progress to the last eight. "I am sure Michael will understand that I am over over the moon to play him and not Ding - who has beaten me a few times," Dale said. "I was very impressed with his potting, break building and demeanour. "He had a nothing to lose attitude and he will be very happy playing me after beating Ding. It will be a tough match."